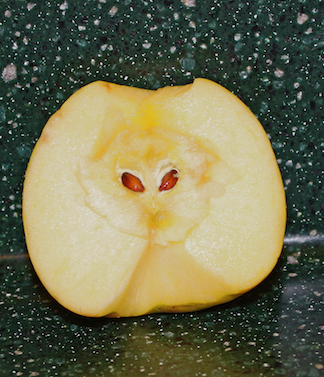 There’s an Alien in my Apple ! Since early childhood I have been hearing and reading about visions that people see in clouds, in tree bark, on their toast, and various other places. Such people seem to be, mostly, religious folk, such as Pastafarians or Catholics who see visions of FSM, The Virgin Mary, etc. Be that as it may, after traveling around the sun almost 79 times aboard this damp dirt ball we call home, I have finally witnessed my very own vision . . .
. . . the face of an alien in the apple I sliced open last evening. Apples are one of my favorite snacks, and I find the apples from the Sierra foothills near Tehachapi to be particularly delicious. I will enjoy them even more, now that I know they have been blessed by visitors from outer space! This entry was posted in Miscellaneous Musings and tagged aliens, Apple, extra terrestrial, Fruits and Vegetables. Bookmark the permalink. 1 Response to There’s an Alien in my Apple !